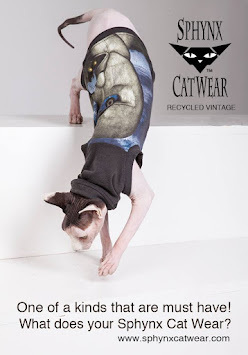 The cats and I went to Ocean City, Maryland to participate in the Pet Threadz Fashion Expo. The ride down was fine, but the weather was less than hospitable (wet, windy and cold). It was too cold to walk the cats on the boardwalk, and it didn't look as if the weather would warm enough to swing it. The hotel (LaQuinta Inn) was clean and comfortable. I even managed an ocean view, albeit blocked mostly by the Hilton. It was funny, the Hilton just towering above as if to say "This is what you losers get for not staying with us." Despite this, the cats managed to snuggle in and catch some nap time. With kidz secured, I ventured out Friday night to find a good meal and a drink. Barn34 was the place to be, I recommend it. On Saturday morning, we went to the Powell Convention Center. We did a meet and greet with other participants as well as visit the booths of the rescue organizations in attendance. Later that afternoon, we did Rescue Rocks the Runway Fashion Show and costume contest. We didn't win anything, not that we were trying. We had a bit of a wardrobe malfunction, and I had to carry both cats across the runway, which didn't highlight their lovely outfits well. No matter, a good time was had by all. I was with our friend, Teri of Coco the Couture Cat. Coco won bet pet presentation or course, #DivaontheCatWalk. Later that evening, Teri and I went to Guido's Mexican restaurant; a mediocre meal at best, not worth the price. I woke up Sunday morning thinking that my weekend was going to be a bust and instead rose to a glorious sunrise. The mighty wind turned to a slight breeze, the dampness dried and the warmth came. We were able to get that boardwalk stroll after all. Coco, Moshe Moshi, and Lexi Liu drew tons of attention, so much so that we may create a fundraiser out of it (I'll let you know). It was an excellent conclusion to our weekend.